AzhwAr asks whether he, who would not praise brahmA, rudhra et al who have abundant knowledge and power, will praise lowly human beings. nAkkoNdu mAnidam pAdEn – Just as it is said “sA jihvA yA harim sthauthi” (only that which praises emperumAn is tongue), I will not sing about lowly human beings with the tongue which is to be used only for singing about emperumAn. thIkkoNda senjadaiyAn – one who has reddish matted hair which has agni, that irritates the eyes, in it. Alternatively, just as poygai AzhwAr had mentioned in mudhal thiruvandhAdhi 97 “anaRku angai ERRAn” (held his beautiful hands for fire), one who has fire in his hands and reddish matted hair. pUkkoNdu vallavARu enRum Eththa – taking soft flower, water, lamp, dhUpam (fragrant smoke) etc, which are the implements for carrying out thiruvArAdhanam (divine worship), appropriate for the soft divine form of emperumAn. Worshipping emperumAn every day, utilising the knowledge and power that he (rudhra) has, to the extent that he can. Mentioning flower is representative of other materials required for carrying out worhip. enRum nalamAga Eththa – praising emperumAn appropriate to his greatness, at all times. vallavARu Eththa – however much one praises him, it (the act of praising) can never be considered to have been completed. Hence, praising (worshipping) him to the extent that one can. mahAbhAratham karNa parvam 83-65 says “varshAyuthair yasya guNA na SakyA vakthum samEthairapi sarvalOkai: ” (whose qualities cannot be spoken of even if (people in) all the worlds get together and speak for ten thousand years…. ); nammAzhwAr in his thiruvAimozhi 4-3-10 mercifully says “yAnum Eththi Ezhulagum muRRumEththip pinnaiyum thAnumEththilum thannai Eththa Eththa engeydum ” (even after I (who had been given knowledge through emperumAn’s grace) praise him, even after all the (people in the) seven worlds praise him, even after he himself praises him, is it possible to complete praising him?) emperumAn is of the kind where it is not possible to complete praising him. What is the reason for emperumAn not being happy despite a superior entity such as rudhra praising him? vaigundhach chelvanAr – since he is the lord of all the opulence in SrIvaikuNtam, such praises by dhEvas (celestial entities) will not bring about any change in his stature. magizhAdha vaigundhach chelvanAr – did not vEdham also say as in thaiththirIya upanishath nArAyaNavalli 10-20 “vruksha iva sthabdhO dhivi thishtathyEka” (emperumAn remains as incomparable in paramapadham, without any change, like a tree)? magizhAdha vaigundhach chelvanAr – emperumAn does not feel happy when entities such as rudhra et al praise him as these entities, when qualities of rajas and thamas (passion and ignorance) are prominent, gear up to fight with him. He is happy being praised with deep affection, by nithyas (nithyasUris, the permanent dwellers of SrIvaikuNtam) and mukthAthmAs (those who have been liberated from samsAram and have attained SrIvaikuNtam)) in SrIvaikuNtam. 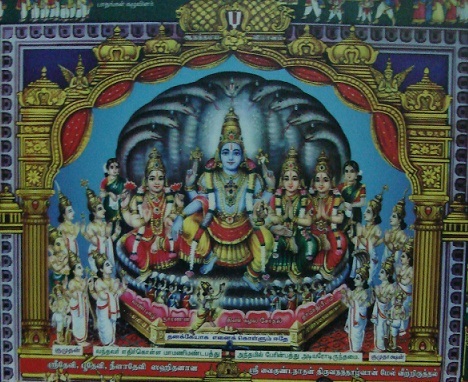 selvanAr sEvadimEl pAttu – with the pAsurams which have been sung on the divine feet of emperumAn who is the wealth of pirAtti (SrI mahAlakshmi), I will not praise the lowly human beings, says AzhwAr. We will move on to the 76th pAsuram. This entry was posted in iyaRpA, nAnmugan thiruvandhAdhi on September 2, 2018 by T N Krishnan.